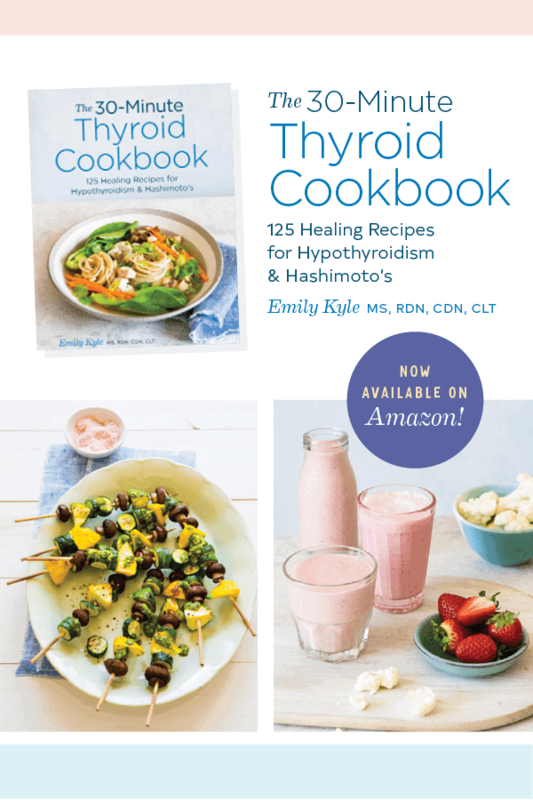 I am thrilled to announce the arrival of my new cookbook The 30-Minute Thyroid Cookbook: 125 Healing Recipes for Hypothyroidism and Hashimoto’s which is now available on Amazon and Barnes and Noble. The 30-Minute Thyroid Cookbook offers the fastest, everyday recipes to take control of hypothyroidism and Hashimoto’s symptoms for long-term relief. When you’re dealing with symptom flare-ups, the last thing you want to do is spend hours cooking. 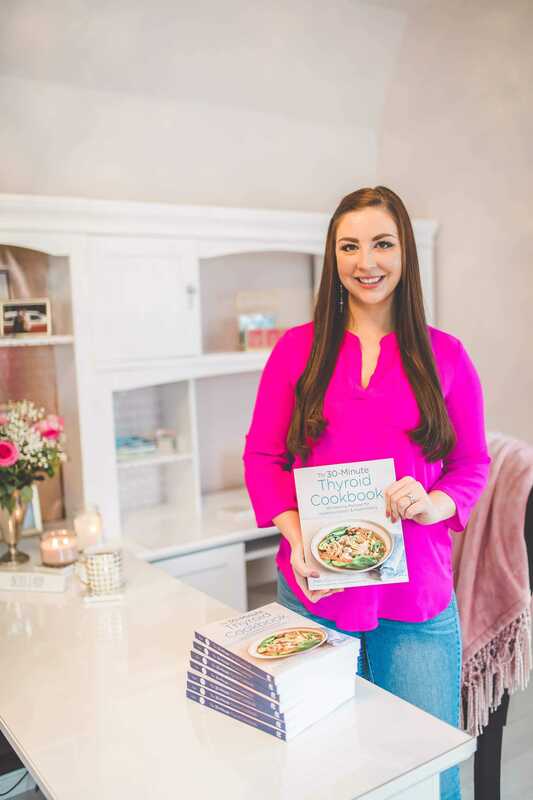 The 30-Minute Thyroid Cookbook offers quick recipe solutions to manage hypothyroid and Hashimoto’s symptoms, so that you can get in and out of the kitchen and back to your life. From Crispy Baked Tempeh Fingers to Rub Roasted Pork Tenderloin, these no-fuss recipes combine quick and easy prep and cook times for table-ready meals in 30-minutes or less. 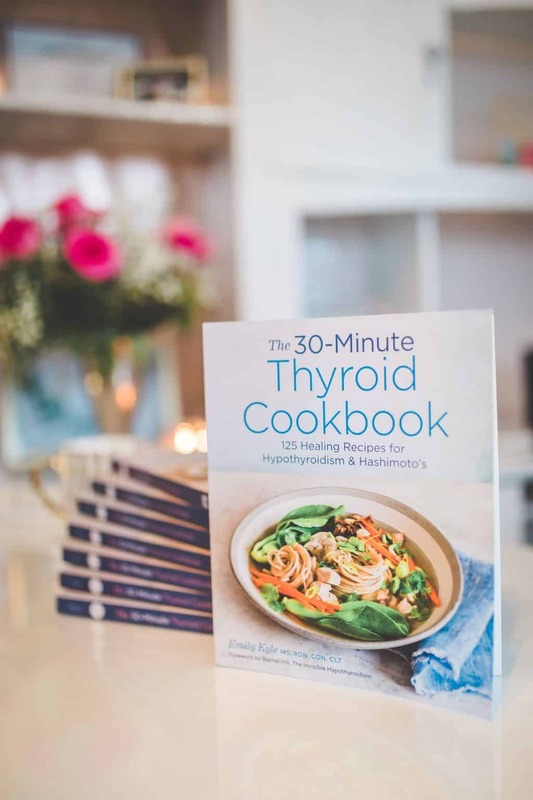 Complete with a guide to setting up a thyroid-friendly kitchen, plus tons of tips and tricks to make home cooking easier, The 30-Minute Thyroid Cookbook is an everyday solution to get long-term symptom relief. An essential introduction that explains the thyroid-diet connection, and offers instruction on foods to eat and avoid, along with guidelines for preparing your pantry and eating out. 125 recipes that are all gluten-free and dairy-free, and ready to eat in 30-minutes or less. Quick reference labels that allow you to choose what to eat based on your needs, with labels for Paleo, Autoimmune Protocol (AIP), Elimination Provocation (EP), and more! Don’t let a busy day get in the way of eating foods that support optimal thyroid function. Heal your body with nourishing, quick and easy recipes from The 30-Minute Thyroid Cookbook. I believe in a holistic approach to managing Hashimoto’s and hypothyroidism, combining medical nutrition therapy with proper holistic health counseling interventions. As many of you know, I have suffered through my own health issues, which was the catalyst for working on this book. With my focus on autoimmune conditions, I am so excited to bring this to the millions of women living with Hashimoto’s and Hypothyroidism. The book itself is dairy-free and gluten-free and goes deep down into the autoimmune protocol, the elimination provocation diet, the paleo diet and even vegan and plant-based diets to help you identify your own inflammatory triggers and create a personalized diet that is right for you. And even more importantly, please share this book with an autoimmune warrior on social media or in real life, it is my goal that this book helps as many people possible. The Invisible Hypothyroidism website is an invaluable resource for a realistic, compassionate, and knowledgeable approach to living, and thriving, with thyroid conditions. The founder, Rachel Hill, is a Thyroid Patient Expert and Advocate and is a trusted resource among the thyroid community. I am so thankful that she shared her knowledge and credibility when writing the forward to this book, and I hope you find her to be a valuable resource on your health journey. LetsGetChecked is a diagnostics platform linking customers to laboratories for personal health testing and subsequently providing actionable information and robust clinical pathways for customers in need of treatment and care. LetsGetChecked customers can order tests online or attend participating pharmacies to get checked within a dedicated consultation suite. Customers can take confidence in knowing that their tests are anonymised with a unique barcoding system. Once your kit is activated through a personal online account, you can collect your sample and return to our laboratory using the pre-paid envelope provided. Your results will be processed, analysed and returned to your personal account in a matter of days. At any stage during the process, you can request a call from a registered nursing team from your personal dashboard by pressing the “CALL NURSE” function. This human touch point is there, for those who need it and to make the testing process personal. LetsGetChecked provides the opportunity for people to take a more proactive approach in managing their health, the work around people’s busy schedules and provide a more accessible route for testing. The thyroid antibody test from LetsGetChecked will determine how your thyroid is performing by looking at thyroid stimulating hormone (TSH), free thyroxine (T4), free triiodothyronine (T3), TGAB and TPEX. The presence of TGAB or TPEX antibodies can indicate thyroid damage which can include autoimmune disorders. I am so thankful for the wonderful people in my life who have taken the time to read, enjoy, and review my book. Below you will find many of the reviews from colleagues and other practitioners in the healthcare space. If you’re not sure where to begin in locating which type of foods you personally should be avoiding to improve your health, then it’s worth knowing that Emily has included steps on how to discover this. It really needn’t be daunting. “Emily has done the dirty work for you and given you the cliff note version of managing both hypothyroidism and a disease called Hashimoto’s with dietary interventions. Yes, I couldn’t agree more! Thank you so, so much! I can’t wait to share it with you! Thank you so much for all of your continued support, I am so lucky to have a friend like you! Thank you SO much Lorie!! I’m literally so excited for this. Congrats times a hundred Emily! What an amazing achievement! Congratulations!! I know that your hard work has fruited many successes but I am especially excited about this one. What an amazing cookbook – I can’t wait to get my hands on this resource. Congrats, friend, so proud of you!!! I’m so excited for you. Congrats a million times!! Sooooo so so happy for you! Can’t wait to get my hands on the book! This will be an awesome resource for so many women out there! Its always nice to have recipes to help heal the body.